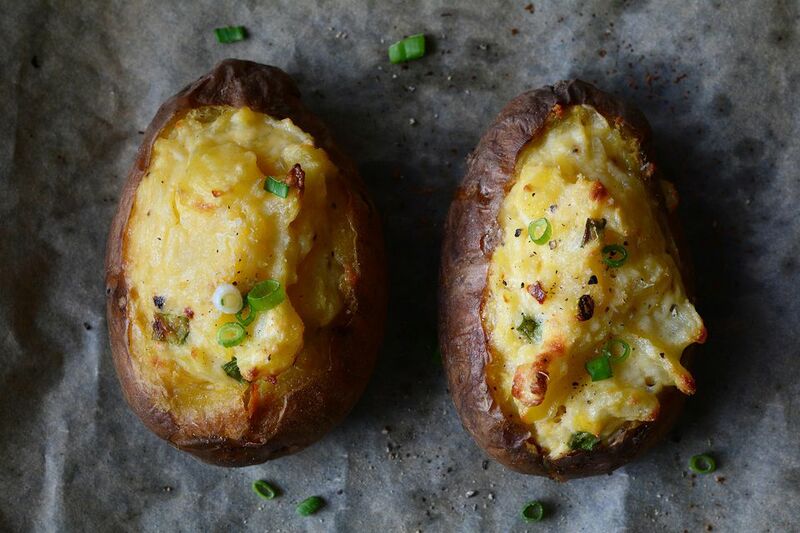 If you need a delicious side to go with a fresh of the grill steak, rotisserie chicken, pork or beef roast, then give this twice baked potato recipe a try. Creamy and flavorful, this is the ultimate comfort food side dish. Wash and dry potatoes. Pierce each one multiple times with a fork. Place onto a baking sheet and bake for 40-45 minutes at 375 degrees. If using larger potatoes, extend the time to 50-55 minutes. To test for doneness, pierce with a fork. If it is tender and goes right through, the potatoes are done. Remove from oven and let potatoes cool for 15 minutes or so before handling. Slit potatoes vertically, but only cut halfway through. Carefully scoop out 3/4 of the cooked flesh. You do not need to remove all of it and should leave some behind to help keep the potato shells sturdy. Add the scooped out portion into a large bowl. Add the yogurt, cream cheese, butter and milk. Using a hand held mixer, blend ingredients together. Use more milk if needed. Add remaining ingredients, except for the reserved portions of bacon and spring onion listed above. Use a spoon to combine the ingredients. Taste for salt. Scoop equal portions into the 6 potato shells. Garnish with reserved bacon and spring onion. Return potatoes to a 425-degree oven for 10-12 minutes. Once the potatoes begin to form a slightly golden crust, remove from oven and serve.